Rock Band 3 launches October 26, bringing with it three free and nine paid tracks from classic rock band The Doors and a confusing new way to classify downloadable music. Three of The Doors biggest hits will be available the week of Rock Band 3's launch: "Light my Fire," "Riders on the Storm," and "Touch Me." Each track will be free to download until November 1, and will support (deep breath) five-button guitar and bass, Drums, Pro Drums and Keys, Pro Keys, harmonies, and will also feature a free expansion that will add Pro Guitar and Pro Bass. If this is a trend, don't expect to see many Rock Band music updates from me in the future. "I'm very excited that keyboards are finally a part of Rock Band. It's about time you guys got hip to the necessity of keys in rock," said Ray Manzarek, keyboardist for The Doors. "This is going to be great for all the gamers, because it's a lot more difficult. Rock Band 3 will require some brainwork, so . . . 'Break On Through!' The free downloads, 'Light My Fire,' 'Riders On the Storm' and 'Touch Me,' are all great keyboard songs. 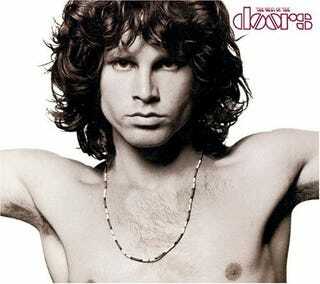 And look out for The Doors' lost masterpiece, Live in Vancouver, when it comes out Nov. 22!" Did Manzarek really just pull "Break on through!" on us? Morrison would punch him in the neck. The three free tracks are accompanied by nine more paid tracks, each supporting Drums, Pro Drums, five-button guitar and bass parts and, where applicable, harmonies and Keys/Pro Keys parts. Damn that's annoying. Just look at the list. * "Hello, I Love You"
* "Love Me Two Times"